I have a left-hand bolt for my Tavor but had no idea how to install it. At this weekend’s Bullpup Convention at Rockcastle Shooting Center, Casey Flack from IWI had an armorer’s class on doing the conversion. It takes basic tools, mostly correctly sized punches, and the ability to follow instructions closely for about twenty minutes. Not the kind of changeover that can be done between shooters at a range, but not rocket surgery, either. 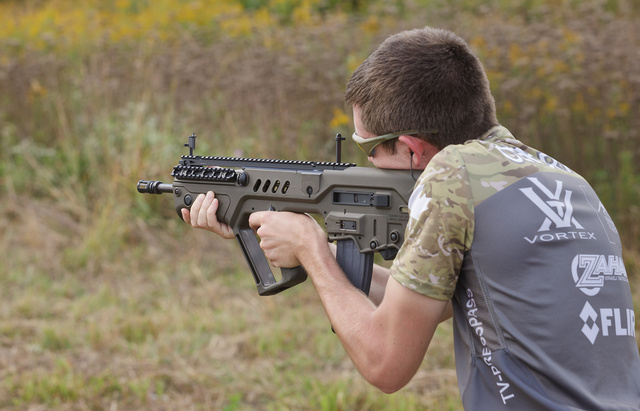 Since Tavor is “unrestricted” in Canada, it’s quite popular there. SInce they have no restrictions on short barrels, I suspect the X95 (13″ barrel) will eventually show up there as well. I saw a sample at the convention, it’s a nice, trim design with magazine release accessible to the strong hand without moving from the pistol grip. I also discovered that the tritium front sight works well with both eyes open. In low light, that’s a huge advantage — the sight picture is nice and bright even with the relatively small rear aperture. Geissele trigger got installed — that took all of a minute. The trigger pull got improved greatly but, strangely, racking the bolt got harder. There’s now a slight snag in the middle of the stroke. I will post comparative photos later. Quite a few Tavors were in use at the event, and I was favorably impressed with reliability. So far, I’ve not actually witnessed a malfunction with any rifle of that model. This entry was posted in rifle and tagged 223, bullpup. Bookmark the permalink. The only malfunctions I’ve had with mine were all operator induced. It has fired everything I’ve run through it including stuff that had my AR throwing a hissy fit. The flip up sites are pretty nice but they look nekkid without an optic, and maybe a beverage holder…. 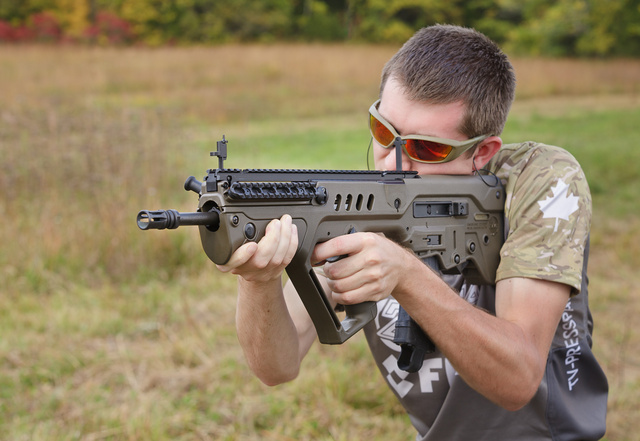 The X95 would probably be a Prohibited fire arm in Canada, regardless of barrel lenght. Please see the above link. There are restrictions on barrel lenghts, which determines if a fire arm is deemed non-restricted, restricted or prohibited. Non- restricted, are fire arms with barrel lenght 18.5 or more (rifles). Prohibited, no civilian ownership allowed. Certain fire arms regardless of barrel lenght (such as AR15 and FN SCAR).